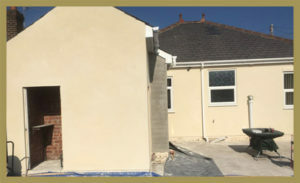 Rendering is the process of covering and protecting the materials your property is made from (usually bricks or blocks) by applying an external wall cover. This cover is then usually painted to protect it from cracking and becoming damaged. We have been rendering the outside of properties for over twenty years, protecting them from the elements and ensuring a smooth, professional finish that gives you the wow factor. If you’re interested in finding out more about rendering, just contact us on 01253 625 015. We use a particular type of rendering often referred to as K Rendering. Once the rendering is complete, we can paint the outside of your house, ensuring a smooth, perfect finish, that’s bound to impress the neighbours! To find out more about our painting and decorating services, just click here. We specialise in rendering, painting and decorating, tilling, plastering and kitchen and bathroom fitting. If you’re interested in rendering your property or want to know more about the other services we offer, just fill in the contact form on our contact page here.